Take the Kanto Bus (any destination) from either the No. 0 or the No. 1 bus stop at the north exit of Ogikubo Station. Get off at Ogikubo Keisatsusho-mae (Ogikubo Police Station). Bus ride takes roughly 5 minutes. Take the Kanto Bus from either the No. 3 bus stop at the north exit of NIshiogikubo Station. Get off at Ogikubo Keisatsusho-mae (Ogikubo Police Station). Bus ride takes roughly 7 minutes. Take the Seibu Bus bound for Ogikubo Station and get off at Ogikubo Keisatsu-mae (Ogikubo Police Station). An approximately 5-minute bus ride. Take the Seibu Bus bound for Ogikubo Station (that passes Kamiigusa Station) from the south exit of Shakujii-Koen. Get off at Ogikubo Keisatsu-mae (Ogikubo Police Station). Bus ride takes about 20 minutes. 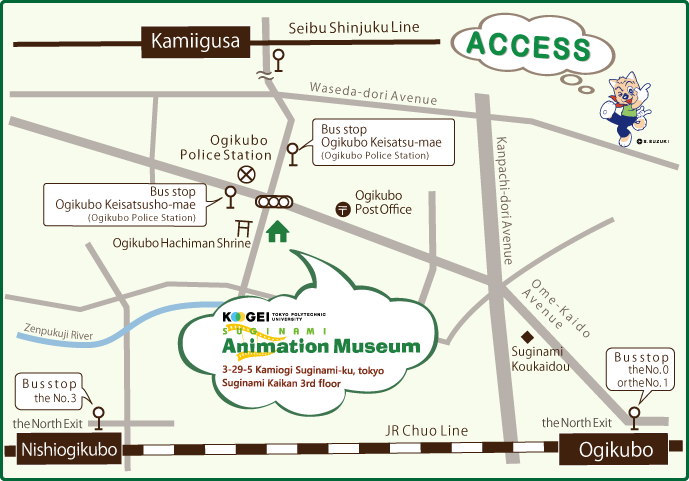 ※The museum does not have an exclusive parking area. Visitors by car are requested to use nearby coin-parking areas.